Cinema was not invented, it was, rather, a consequential development over hundreds of years. Scientific and entertainment forms combined with emerging technology to create moving pictures. Entertainment and popular culture came together with storytelling, business and education to form cinema. During the 17th century, the projection of ‘moving pictures’ consisted of magic lantern shows which used a series of tricks such as overlaying, dissolving and superimposing slides over one another and the use of mechanical levers to provide the illusion of movement for the entertainment and amusement of audiences. However, from 1827 when the first still photograph was taken, numerous inventors across the globe began the quest to record a moving image. During this time various apparatus were designed to create the illusion of moving pictures (e.g. zoetrope, kinetoscope), but these did not cater for the projection of the image to a large audience. Inventors including Edison, the Lumiere Brothers, RW Paul, Georges Melies and many others were instrumental in the creation of what we know today as cinema, with the earliest recorded films dating from around 1895. Many Scots experienced the new attraction of moving pictures at fairgrounds and music halls. In this lesson guide (and using the Early Cinema Learning Journey) you can learn about the contexts in which people watched early cinema and find out about one of the most popular film genres of that era: the local topical. From around 1895 to 1910, films were screened at fairgrounds and music halls. Like the lantern showmen who would provide a live performance of music, sound, drama and storytelling to accompany still images, the early film showmen provided a similar experience with the notable attraction that their pictures really were moving or ‘living’. A large number of Scots experienced their first moving picture show at the fairground, amongst the coconut shies and rides such as the Whip and carousel, in a large tent-like structure called the Bioscope or Cinematograph. Like all new attractions, whilst the Bioscope or Cinematograph proved popular, it was unknown whether it would last. During this time, it was regarded as just another attraction alongside the entertainers, waxworks and freak shows. Fairgrounds were considered affordable entertainment for many working class Scots and the travelling shows became regarded as entertainment for the working classes. The popularity of film shows at the travelling fairs accelerated the production and exhibition of films for money. The Bioscope and Cinematograph booths were travelling attractions that were set up up on village greens and in local parks. 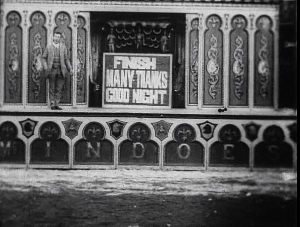 The booths were hooked up to a large traction engine which generated power for the projection equipment – also called the Bioscope or Cinematograph (and from which the show got its name). This traction engine was also used to tour the booths from place to place (see Lord and Lady Overtoun's Visit to MacIndoe's Show). The Bioscope and Cinematograph booths were very elaborate affairs. Outside the booth was a stage upon which dancing girls would perform to encourage people to come and find out more about the attraction and spend their hard earned wages. There was generally an organ built onto the frontage to provide the musical entertainment. Being the owner of a fairground attraction was a very competitive business. The showman aimed to encourage as many people as possible into his show. The early film programme would comprise of a number of short items, music hall and comedy sketches (see MacNab’s Visit to London), local events (see Launch at Denny's: Shamrock III), news (see Gordon Highlanders) and often a ‘phantom ride’. The phantom ride involved a camera being attached to the front of a train, tram or other form of transport or the camera operator filming the journey. 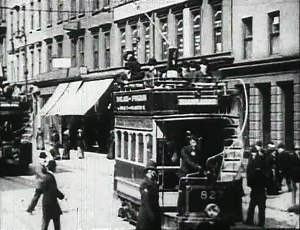 The effect was to make the audience feel like they were experiencing the ride for themselves (see Railway Ride Over the Tay and Glasgow Trams 1902). These phantom rides could be very dramatic for an audience witnessing moving pictures for the first time. Early film showmen cleverly appealed to local audiences by filming local events such as parades or marches, royal visits, stars coming to town and ordinary working class people leaving their work (for more on factory gate films see the Mitchell and Kenyon film collection). The showman would film the crowds of people attending the event with the aim of trying to capture as many faces on film as possible. These crowds were also the showman's target audience. These films become known as actuality or local topical films. Film shows proved increasingly popular at the fairgrounds and reached a far wider audience than the music hall shows did. A demand and thirst for film had been created but with the fairs only being a temporary fixture, there were no dedicated buildings for the screening of films all year round. From around 1910 some of the traveling film showmen set up buildings dedicated to the screening of films. A number of travelling showmen in Scotland, such as George Kemp and his son Harry, became pioneers of Scotland’s first cinemas (see The Kemp Family biography on Scotland's Moving Image Archive website). In the early days, the cinema as we know it today was called the ‘Kinema’ or ‘Kinematograph’ or ‘Electric Picture Palace’ and many of Scotland’s cinemas were built during the period between 1910 to 1938. (Look up The Hippodrome in Bo’ness – Scotland’s oldest working cinema). Cinema proved incredibly popular in Scotland. During the 1930s, Glasgow had the most cinemas per head of the population in the whole of Europe – in 1929 there were 113 in Glasgow alone. Most cinemas contained just the one screen with the larger cinemas seating up to 2,000 people for one showing. The Hollywood film industry was emerging at a growing rate with stars such as Mary Pickford, Rudolph Valentino and Douglas Fairbanks popular during the period 1910 – 1920. With dramatic fiction films and comedies being made and distributed across the UK and imported from America, the film industry was a booming business. However, the cinema managers did not forget their local audience – in fact they embraced them. Much like they had done in the fairgrounds, the showmen – now cinema managers - continued to make local films for screening in their cinemas. They continued to film local topical events such sports days, galas and fairs, news items, visits by royalty, dignitaries, stars and politicians. 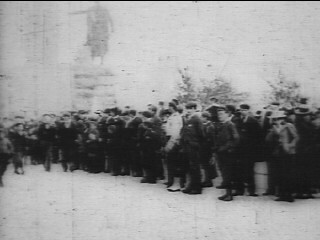 Again, whilst these events were the subject of the film, the focus remained very much on the crowds of people attending with the local people having far more time on screen than the ‘star’. This focus on the crowds (and therefore the target audience for the film) was the feature that made these local topical films unique. The topicals were completely different from newsreel films in that the local topical was intended to entertain, while the newsreel was made to inform. (See comparison activity below). The local topical film, alongside a local or national newsreel, formed part of the regular cinema experience for many years until approximately the 1950’s. It would have been shown before the main feature film. Today these cinema programmes containing a variety of films are a thing of the past. Gone are the local topicals, newsreels and B-movies that were the staple diet of many cinema programmes for the first 50 years in the history of cinema exhibition. Is cinema better today or was the experience better in the bygone years? You can decide for yourself. Find out how many cinemas your local town had – what were they called, how many screens did they have, how many people could they seat and how many are left today? Look at the Scottish Cinemas website and research whether any of the films mentioned survive by searching Scotland's Moving Image Archive website. What do you think it would have been like to watch a film with 2,000 people? Write an account of going to the cinema in the past. Create a table with three columns and nine rows. Label the first column ‘Question’, the second column, ‘Local Topical – Harry Lauder visits the Regent Cinema, Glasgow’ and the third column ‘Newsreel – Vera Reynolds visits the Regent Cinema, Glasgow’. What are the camera angles? Who do we see in the film? How long is Harry on screen? Where is he located within the screen frame (e.g. middle or side of the side)? Who else do we see? Who or what does the film direct your attention to? What do the intertitle cards tell you? 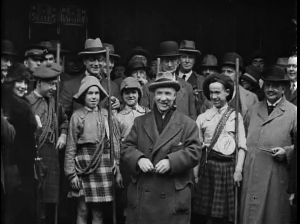 Watch Harry Lauder visits the Regent Cinema, Glasgow to view Huntingtower and then complete the grid. Then watch Vera Reynolds visits the Regent Cinema, Glasgow and complete the grid. Compare the similarities and differences between the two films. 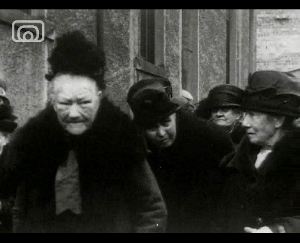 Can you describe why a newsreel is different from a local topical? Storyboard and then film a local event or activity in the same way as a local topical would have been made. Then storyboard and film a newsreel film about the same event. Present to an audience and explain the differences between the two films and reasons for this. Watch The Other Man’s Job’, a wartime newsreel propaganda film, informing people what Scotland was doing for the war effort during World War II. Divide a piece of paper/whiteboard/flipchart into four boxes by drawing a line down and across the middle of the page – write the following at the top of each particular box 'Sound', 'Story', 'Tone', 'People'. Screen the film once. Then divide into four groups. Ask one group to look at all the different sounds heard in the film; one group to look at what the film is about and how the story is told; one group to note down how the film makes them feel – the emotions felt and how the information is put across – authoritative/ informative/ instructional or from a particular person’s point of view; the last group is to look at the people featured in the film – who are they, what is unusual about them. Screen the film again and then ask the four groups to feedback. Note down the answers on the paper/board/chart. Why did they make the film? Who is the film aimed at? Where do you think it was seen? Discuss in general how all these elements combine to make you read the film in a particular way. Next, create a plan to make a film about the same subject, but this time from the point of view of one of the people in the film. Think about the elements you used to deconstruct the propaganda film and use these to construct your new film. Then discuss how different the film would be and why.